usagymwestern.com is a USA Gymnastics production. To learn more about USA Gymnastics, visit usagym.org. SALT LAKE CITY, Utah, May 6, 2018 – The 2018 Women’s Junior Olympic Level 9 Western Championships in Salt Lake City, Utah, at the Mountain America Expo Center, wrapped up earlier today after crowning the final four all-around champions. The Level 9 Eastern and Western Championships are the culmination of the Junior Olympic Level 9 competitive season, and each features the nation’s top Level 9 gymnasts in the respective regions. The Junior Olympic Eastern and Western Championships are two of USA Gymnastics’ championships events. Both championships feature the top seven gymnasts in the all-around in each age division from the respective regional championships and will have competition in 16 age divisions, which are determined by birth date. 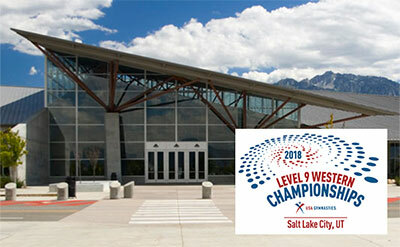 The Western Championships, which showcases the top gymnasts from Regions 1-4, is hosted by Performance Plus Events, Visit Salt Lake, and the Utah Sports Commission. The states that comprise each region are: Region 1 — Arizona, California, Nevada, Utah; Region 2 – Alaska, Hawaii, Idaho, Montana, Oregon, Washington; Region 3 – Arkansas, Colorado, Kansas, New Mexico, Oklahoma, Texas, Wyoming; and Region 4 – Iowa, Minnesota, Missouri, Nebraska, North Dakota, South Dakota, Wisconsin.